nd : comp. : de :prev. :: used in: pre. associated butterfat differentials, by markets are reported on table 2.
for the first four months of 1970 was 63 percent, compared to 66 percent for the first four months of 1969. January, February, and March are presented on table 13.
billion pound., 0.8 percent above Auch sales in April of last year. cream sales in March, especially heavy and sour creams, is partially attributed to the occurrence of the Easter holiday. and the four major product groupings (whole milk, skim milk items, mixtures, and cream) are reported on table 8.
milk with solids added continued to show the largest increases, increasing 20.3 percent and 13.3 percent, respectively. 3.4 percent. Daily average sales of individual fluid milk products are shown on table 9.
:of :Pet. : Pc : Pct. : : : Pet. :Pct. : : Pct. : t. : : Pet. Pct. / Price at 201-210 mile zone, 40 cents less. 3/ Price excludes an 8-cent direct delivery differential. PRICES PER 100 POUNDS FA DIFFER NTIAL 0. Northern lowa, Geosgia, and Oregon-Washington. 4/ ew York metropolitan area. Price excludes a S-cent direct delivery differential. plus 10 cents. 1/ Dayton. Class II price, plus 20 cents for skin milk used to produce cottage cheese. gi Zone II (Maruette). j/ Weighted average of all handlers' blend prices at all locations. 17/ Zone I. 18/ Indianapolis. j/ Base sone. blead prices. / Rock Island, Illinois. 2/ Base sone (Fargo). 7J Zone I (St. Louis). 2I/ Kansea City and Topeft. 29 Pittsburg, Kanse. 3/ Gulfport. Class I and blend price at Jackson and Greenville 16 cents less. 3/ Atlanta. Little Rock. 3/ Oklahoma City. a/ Class II (butter, cheese, and nonfat dry milk) $4.38. 5/ Wichita Palls Texas. Amarillo. 7/ Momroe and Shreveport. 3/ Zone I (Dalla). 39/ Abilene. Class II-A (cheddar cheese) $6.09. Zone I-Mew Braunfels, Texas. 1/ Class II-A (cheddar cheese) $4.10. 2/ Mercedes. 43/ Houstoa. _/ Denver. (Seattle). 5J Spokane, Washington. 2/ Portland. TABLE 3.-FEDERAL ORDER MINIMUM CLASS I AND BLEND PRICES FOR MILK OF 3.5 PERCENT BUTTERFAT CONTENT, F.O.B. TABLE L&--FEDERAL ORDER MINIMUM CLASS I AND BLEND PRICES FOR MILK OF 3.5 PERCENT BUTTERFAT CONTENT, F.O.B. MARKET OR OTHER INDICATED POINT, JANUARY APRIL. I IadSS 11/ -Cl. / See footnotes on table 2 for location at which price is reported. / markets under regulation on January 1, 1969, and which have had no significant marketing area expansions. Ecludes Kinneapolis-St. Paul, Southeastern Minnesota-Northern Iowa, Georgia, and Oregon-Wahington. AVERAGE DAILY DELIVERIES PER PRODUCER. AVERAGE DAILY DELIVERIES PER PRODUCER. AmPE L --4. &.srA a n A| . VE.rAlg .rf TTLh Ifl 2O6 6U- J16VS &#&,& .6 S. &&* &Ia 0 . St. Paul, Southeastern Mimnesota-orthern Iowa, Georgia, and OreSon-Washington. St. Pul, SkwtbhasteraN Miaota-Norther lowa, Goergi, aad Oregos-Washbiaton. I/ May oelasue som duplication due to atertarket traustr. SMkart mdrt rqulatlam e o Jm l ry 1, 1969, 4ad which have had s, statfitcat marketing area 4peauitos. Mlede MIep1lis-Ste. Paul, ekthbemetws MiNmelsotalortherL loam, Georia, aad Oregoa-VaUhiue. 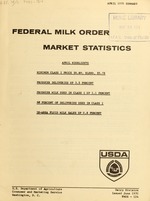 Southern Illinois :Uses the St.
Table 7.--Federal milk order Class I formula price information, April 1970 -Con. NEW YORK-NEW JERSEY / -- --- --- --- --- --- --- --- ..
SPlain, flavored, and fluid equiva4let of concentrated. Plain, fortified, and fIlared skim and part skin milk, buttermilk, and cultured specialties. Sales for marketing are as defined after the 1969 amendment. Small amount of ele estimated. Dollars per 100 b. Dollars per 100 lb. Dol per 100 lb. :: Dol. per 100 lb. Product Composition : : "
Number : 1000 lb:: Number : 1000 lb. :: Number : 1,000 lb. Oregon-Washington, Red River Valley, San Antonio, Southern Illinois, Tampa Bay, Tri-State, and Upper Chesapeake Bay. : : for fluid :for milk used in : e m 2/." :Cents per 4 gal. :Cents per k gal. ::Cents per 1 gal. : Cents per 4 Ib. :Cents per lb. I/ "Fluid Milk and Cream Report," SRS. Prices are the latest reported to the 10th of each month. 1* l lb. : Pt. : il. Lb. : Pct. : Nil. lb. : Pct. N: ml. lb. : rt. Preliminary. I/ "Milk Production," SRS. 2/ "Production of Creamery Butter and Cheese,"
Million pounds : Pet. Million pounds : Pet. Million pounds : Pct. Dry Milk," SIS. 4/ "Summary of Processed Commodities in Store," ASCS. 000 lb. 1.000 lb. 1.000 lb. il. lb. present Class I price in the South Texas order which was due to expire March 31, 1970.
the "pricing zone" provisions. For plants located in Fayette County, Texas, or north of U.S.
such plant is located more than 225 miles from Houston, Texas. such plant is located more than 140 miles from Houston, Texas. "partial Payment" where the term "advance payment" is now used. cream and milk or skim milk. portion of milk which is disposed of for fertilizer or livestock feed or dumped. order. The Class II price is the Minnesota-Wisconsin price for the Month plus 15 cents. butter price by 1.25, add 4 cents and multiply the result by 3.5. (Southeastern Florida only) is 0.115 times the Chicago butter price for the month. present Class I price which was due to expire March 31, 1970.
of the seasonal incentive payment plan (louisville plan) from the Inland Empire order. provisions from the Nebraska-Western Iowa order.